I hope everyone had a great Memorial Day weekend and didn’t make a pig of themselves (sorry, I couldn’t resist the bad joke). But speaking of food and pigs, this story popped up in my alerts today and it was just too good not to share. Theodore is a potbellied pig at Sage Community School, a Klamath County School District charter school near Chiloquin. He was born on the first day of school and moved in about two months ago, said school director Sandra Girdner. Now he spends his days meandering around the school’s garden and being doted upon by students and teachers. But his real purpose — and favorite part of his day, kids said — is eating two buckets of lunch scraps each day, effectively eliminating the school’s food waste. Abbey Peterson, 13, pitched the idea. Her family gives food scraps to their potbellied pigs, and she thought it would be a good way to take care of the lunch waste from the school’s 77 students, aged kindergarten to eighth grade. She and Sam Ekstrom, 13, recruited donated materials from Grange Co-Op; Peterson’s dad built the pen; the Henley High School shop class built a shelter; and the charter school’s 4-H club painted it white with green trim. Ekstrom and Edgar Ortega, 12, took the waste-reducing initiative a step further by building a compost pile next to Theodore’s pen. more via School cuts out food waste, with help of hungry pig | Local/State | The Bulletin. 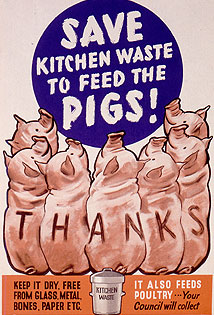 Americans throw away soooo much food, and while composting is definitely a great option, that might not always work, plus there are other options, like livestock who have lived off of our table scraps for 100’s (some probably closer to of 10,000) of years. Schools have shied away from bringing in live animals (I’m still peeved at the school that wouldn’t let a couple of its students ride horses to school instead of drive! ), so I’m thrilled to see one school take advantage of its resources by allowing the pig to help cut down food waste, AND teach kids about food, animals, farming, and all other kids of great lessons they wouldn’t get out of a science textbook!